India U-17 world cup squad secured a historic 2-0 win over a strong U-17 Youth Team of Italy in Arizo, Italy on Friday, 19th May 2017. The win would surely act as a huge boost for the Blue Tigers. 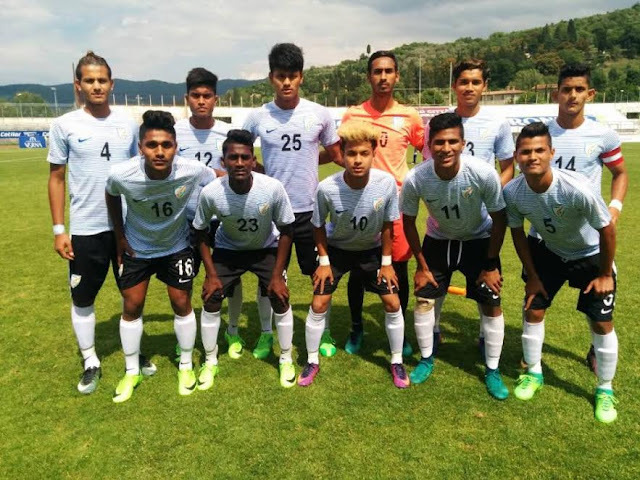 All India Football Federation(AIFF) has been providing rigorous exposure trips to the U-17 World Cup Squad for the last couple of years, all in an effort to field a competitive Team for the FIFA U-17 World Cup, which is slated to kick-off later this year. Strikes by Abhijit Sarkar (31’) and Rahul Praveen (80’) led the Indian U-17 World Cup Team to a massive win over the ‘Azzuri’ in a match largely dominated by the Indian Colts in terms of possession and chances created. The Colts got off the blocks in Italy and gave the opposition a tough time early on. Komal Thatal’s 8th minute strike went whiskers past the Italian custodian as India hunted in packs for an early lead. In the 13th minute, Aniket came close to opening the goal scoring charts for India but his effort went straight down the keeper’s throat resulting in an easy save. In the 31st minute however, the goal for the Indian Colts came when Abhijit Sarkar’s cross took a wicked deflection off the Italian defence line and ended up in the back of the opposition net to give India the lead. After India led 1-0 at half-time, the Colts searched to extend the their lead and safeguard the result. In the 59thminute, Aniket missed a one versus one chance against the Italian goalkeeper after he rounded the opposition custodian up but failed to convert. Rahul in the 75th minute came close to scoring when he failed to tap the ball home from handshaking distance after Aniket’s shot had earned an uncanny save by the Italian custodian. Goal scoring chances every now and then had to bear fruits and it did for the Indian Colts in the 80th minute when Rahul scored from inside the box to double India’s lead as the scoreline read 2-0. The full-time scoreline read the same as the Indian U-17 World Cup Team registered a historic feat in Indian Football.